[Solved] Can't Upload HEVC/H.265 Videos to YouTube? Get Solution Here! YouTube offers the biggest platform for users to upload various videos - cover songs, gameplay walkthrough, wacky videos, educational videos etc, - with the purpose of self-promotion, sharing and so on. Every video which will upload to YouTube should meet upload requirements from file type to length. However, sometimes it still gives an error message about format even though there is an acceptable video. "I tried to upload a HEVC video but then it said 'The video has failed to process. Please make sure you are uploading a supported file type.' Please help me!" Why can't HEVC upload to YouTube? How to upload HEVC to YouTube successfully? Answers can be found here! 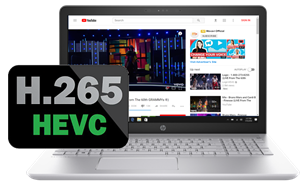 Convert HEVC/H.265 to the best format (H.264) for YouTube, Facebook, Vimeo and other websites for uploading without hassle. Fast transcoding speed and no quality loss. Before we get the troubleshooter to fix HEVC/H.265 won't upload to YouTube, we should have a brief knowledge of the uploading requirements. Generally, users can upload each video up to 15 minutes. The limit can be broken by verifying the account through a text message on mobile phone or an automated voice call. The maximum length of a video is 12 hours with the size less than 128GB. According to above YouTube uploading requirements, HEVC is the supported format by YouTube but why some HEVC/H.265 videos won't upload to YouTube? Reason 1. You may get a HEVC video longer than 15 minutes without verifying account. Fix: Verify your YouTube account to share a longer HEVC video on YouTube. If you are unwilling to offer phone number to verify the account, trim the video to make its length less than 15 minutes. Reason 2. HEVC encoder causes file type error. Occasionally, parameters of HEVC videos encoded with x265, HandBrake or other HEVC encoders probably don't meet the upload requirements perfectly. Therefore, the error about unsupported format will be given. Fix: You're suggested to convert HEVC to H.264, the recommended video codec for YouTube uploading. WinX HD Video Converter Deluxe is a great HEVC to YouTube converter enabling users to transcode HEVC to H.264, MP4, MOV, FLV, 3GP, WebM and other formats with perfectly calculated parameters fully supported by YouTube. Built in hundreds of codecs and device profiles, it can also convert any video to AVI, WMV, MKV, MPEG2, iPhone, iPad, Android, Windows Mobile, Xbox, PS3/4 and more. It uses High Quality Engine and De-interlacing Engine to output vivid images/hi-fi audios of resulting file. And, the support of Hardware Encoder (Intel QSV, Nvidia NVENC), Hyper-threading tech and Super Encode Engine can greatly speed up transcoding code. Now, let's convert HEVC to YouTube with WinX HD Video Converter Deluxe. Beyond everything, please download and install WinX HD Video Converter Deluxe on your computer. The Windows version is available for Windows 10 or lower and the Mac version for macOS High Sierra or lower. Step 1. Launch WinX HD Video Converter Deluxe. Click + Video or drag and drop to import the HEVC video you want to upload to YouTube. Step 2. Output Profile dialogue appears. On the left side, dozens of Output Profile categories are listed. Go to Web Video Profile > YouTube Video. Based on best YouTube encoding settings, select MP4 (codec: h264+aac) as output format. Click OK. Step 3. If necessary, you can click Browse button to define a new folder as destination folder. Finally, click RUN button to start convert HEVC to YouTube. .
After the conversion process is finished, destination folder which saves converted HEVC video will pop up. Now, you can upload the HEVC video to YouTube correctly. What More Can WinX HD Video Converter Deluxe Do? • Free download 360P SD, 720P/1080P HD, 4K UHD videos from YouTube, Vimeo, Vevo, Facebook, Instagram, Twitter or other 300+ sites with original quality. • Create photo slideshow video from an album with MP3 background music in MP4, AVI, MOV, FLV etc, for collecting or sharing. • Crop unwanted part on images of a video; cut a segment off a video; merge several videos into one; add subtitles (.srt) for a video. Best HEVC Decoder Helps Play HEVC/H.265 Videos on TV, PC, Mac etc.